JJC LH-JX100 black or silver LENS HOOD & ADAPTER RING consists of a vented lens hood and adapter ring. 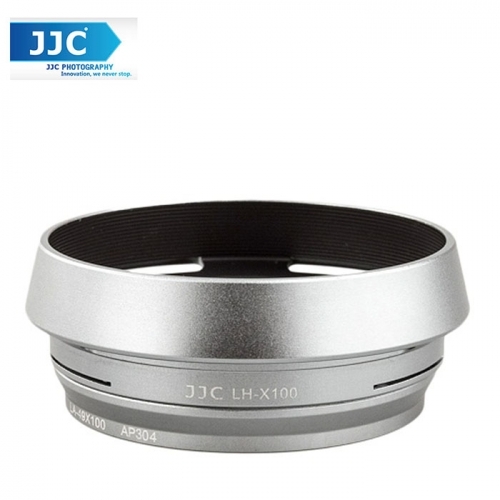 It is specially designed for the lenses of the FUJIFILM X70, X100, X100S and X100T camera. Lens hood is one of the most important accessories for each lens you own. A lens hood provides multiple functions: it shades the lens from stray light, improving your contrast and image quality; in inclement weather, it can assist in keeping moisture or wind-blown debris off the lens; and it protects the front barrel from the inevitable impacts against walls, door frames and other real-life obstacles. The hood features a non-glare matte finish on the interior surface to further prevent or limit lens flare. The adapter ring facilitates the attachment of the lens hood or a 49MM thread filter to the lens. LH-JX100 replaces FUJIFILM LH-X100 Lens Hood. LA-49X100 lens adapter ring replaces FUJIFILM AR-X100 adapter ring.